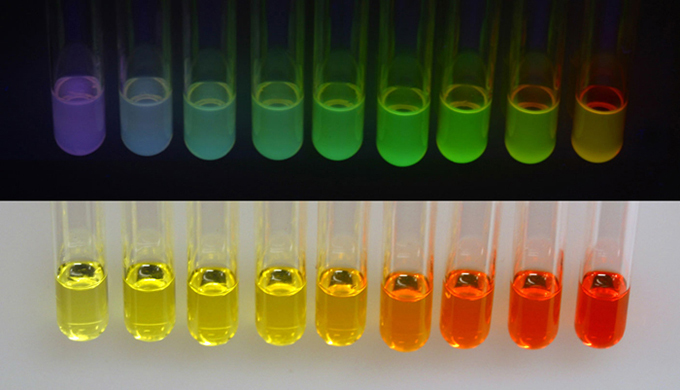 Test tubes with different sized quantum dots suspended in liquid interact differently with light. Nanoparticles are defined as particles that have a radius of less than 100 nanometers. These particles exhibit properties that are different from those of the bulk material from which they are made, namely optical and thermal properties. Engineers and scientists are working together to explore these properties and find applications for them. One example of nanoparticles are quantum dots. Quantum dots are very, very tiny particles on the order of a nanometer in size. They are composed of a hundred to a thousand atoms. These semiconductor materials can be made from an element, such as silicon or germanium, or a compound, such as CdS or CdSe.